The “Driftless Area” of the upper Mississippi River valley is the unglaciated region of the upper midwest. While glaciers encroached on the region from north, west, and east, the karst geology of the region is thought to have limited the flow of glacial ice during the most recent (Wisconsinan) glaciation over what is now parts of four states bordering the Mississippi River. Since the region has no gravel deposits of the kind known as “glacial drift”, and there are no glacial striae on the uppermost surfaces of exposed bedrock, geologists have determined that this glaciation, approximately 22,000 years before the present time, did not cover the southeastern corner of Minnesota, southwest Wisconsin, northwest Illinois, or the northeast corner of Iowa. (Map courtesy of the Driftless Area Initiative). The result of the exposed karst topography has been a landscape with porous and fractured sandstone and limestone and impervious shale layers in horizontal strata overlain by shallow soils, and deeply carved by hydraulic erosion from the outflows of the great glacial lakes. Rapid percolation of snowmelt and precipitation through fractures in the limestone bedrock coalesce into well-oxygenated springs and streams at temperatures close to the mean annual air temperatures for this latitude, about 47° F. Emerging at the base of limestone bluffs and precipitous coulees, and coursing through wooded valleys, the streams of the region provide an ideal habitat for the native brook trout, and, more recently, the introduced brown and rainbow trout. The conservation departments of all four states surrounding the driftless area have aggressive programs in place to sustain and rehabilitate their stream trout fisheries. All of these states classify their waters as to their suitability as trout habitat, and all of them stock hatchery fish in publicly accessible locations where the fish can survive and grow, even if they don’t reproduce. Wild brook trout and brown trout provide the mainstay of the fisheries in Wisconsin and Minnesota. Wisconsin, with 85% of the driftless area, provides detailed maps for downloading as PDF files. Minnesota provides downloadable maps in PDF format, suitable for printing at your local print shop. These maps are also published in a booklet available at MN DNR Area offices, and from the NTC. 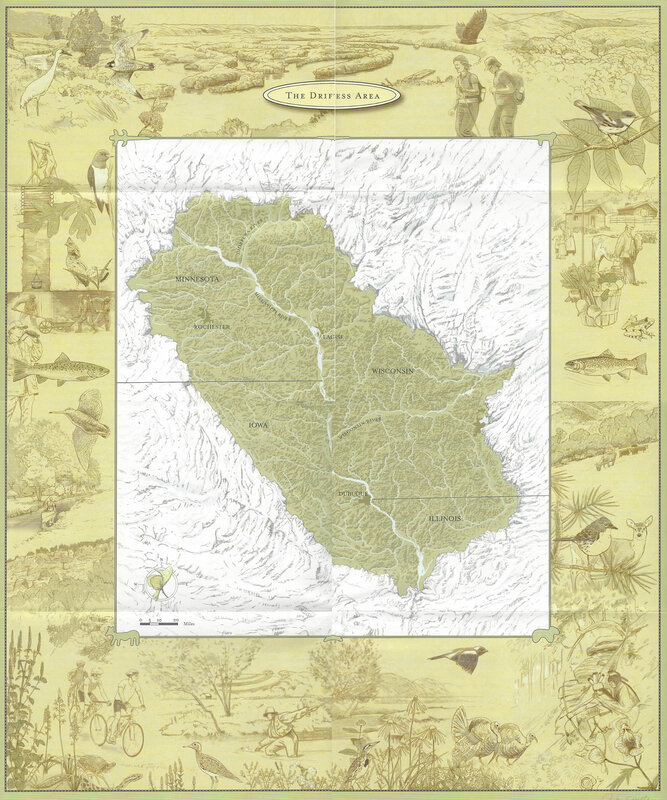 Iowa publishes a nice folding map and guide to trout fishing, available on their web site and by mail. Illinois’ trout fishery features a catchable trout program in many ponds and in the Apple River and tributaries in the northwest corner of the state.